But it’s hard to find Chinese style jerky here. Some good Western style ones can be found, but nothing with that Chinese flavor we miss. 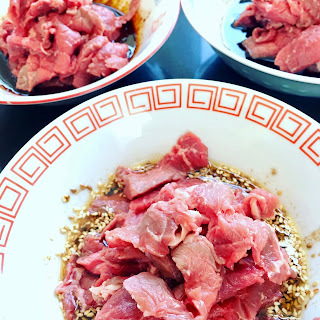 Plus, I like tasting the beef, not just the marinade. And so I make it myself. Here are four different varieties for you, just 'cause I’m in a particularly generous mood. You should use whatever kind of beef you like. 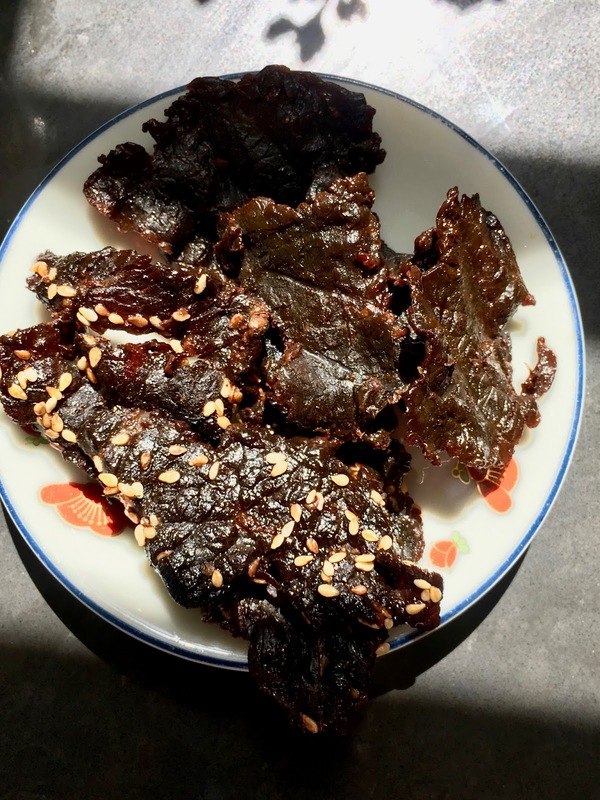 The cut can be expensive or cheap, but I’d go for natural, grass-fed beef, whatever you do, because this jerky really tastes like beef. 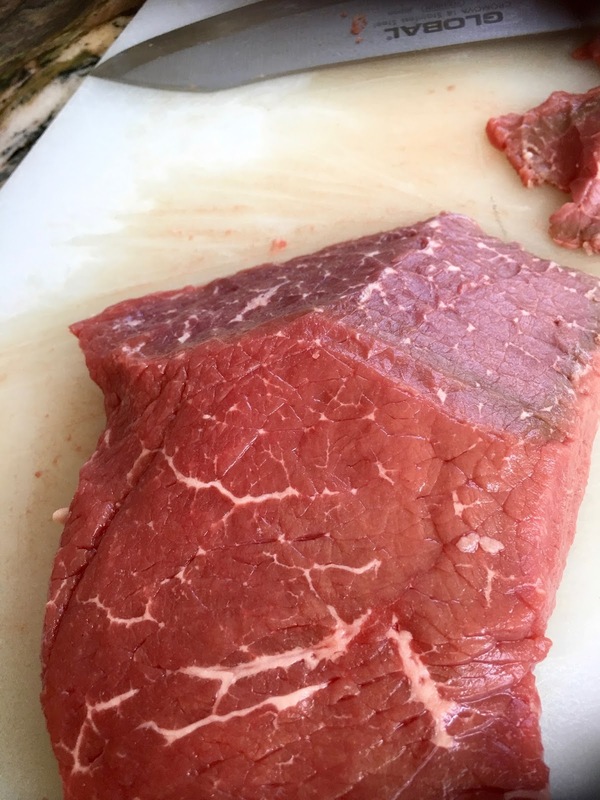 Some folks like flank steak, but London broil is about half the price. See what’s on special and ask your butcher what would be good. I did something very similar to this recently at Whole Foods, and my favorite butcher got almost teary-eyed. He’s from near Guadalajara, and his grandma makes beef jerky, and I think I was unintentionally hitting all sorts of nostalgia buttons. I, of course, asked him how Grandma did hers, and he said it was just salt and pepper, with maybe a squeeze of lime juice. How did she dry it, I asked. That's why I like to do my jerky indoors. And so I’m happy to say that you will be able to harvest every last piece of your jerky, because it’s really easy to do in the oven. Two baking sheets will provide just the right amount of space for the beef. You can cut the meat as thinly as you like. I like it really thin, as it makes the meat almost melt in your mouth. But if you like chewier jerky, by all means cut thicker; the only caveat is that you be sure to dry it out completely. Each of these marinades can work with 2 pounds | 1 kg beef, so if you want to try all four, divide the marinades into fourths. Do note that Chinese marinades have oil in them, which gives the jerky a nice mouth feel and lovely shine. It also counteracts any dryness in the meat. And tastes good. 1. Freeze the steak for about an hour, as this will make it much easier to slice thinly. Set a damp washcloth on the counter and lay your cutting board on top of that to keep it from sliding around. Use your sharpest knife to slice the beef at an angle, making the slices as thin as possible. 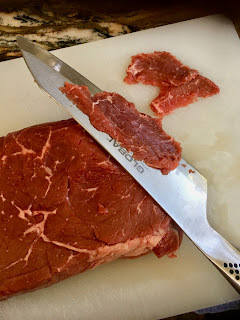 As the pieces become too large, rotate the beef 90° so that you end up shaving the steak into a point. 2. Mix one of the sauces in a medium, microwaveable work bowl. Microwave on high for 1 minute and stir. Microwave it in 1-minute spurts until the sauce is a little syrupy, which will help it cling to the meat and fully season it. Cool the marinade. 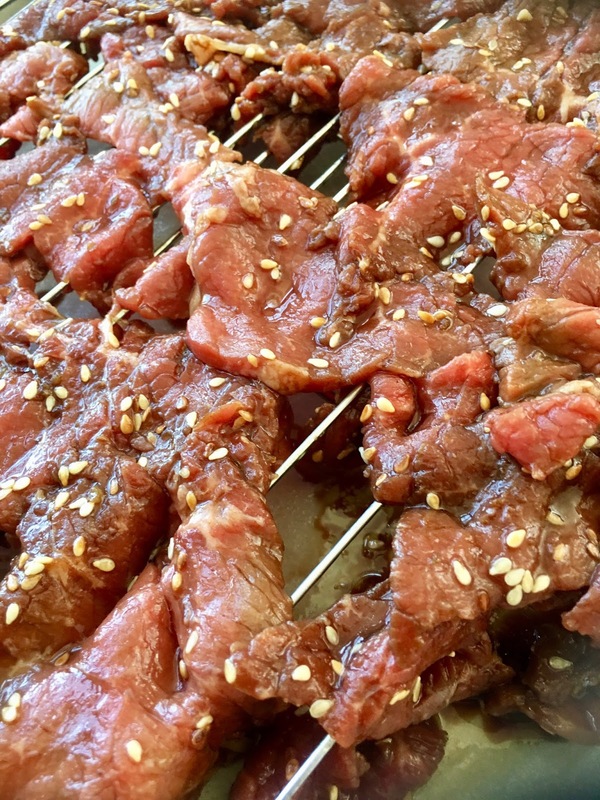 Add the steak and toss gently, using your chopsticks to break apart any clumps. Try to ensure that each slice is thoroughly coated in the marinade. Cover the bowl and refrigerate for an hour or up to overnight; longer is definitely better. Drain off any extra marinade. 3. Place two racks near the center of your oven. Set a convection oven to 150°F | 65°C, or a regular oven to 175°F | 80°C. Line two large, rimmed baking sheets with parchment paper or foil and set cake racks on top; 2 racks per sheet is good, as you want as much room as possible. Spray the racks with oil. 4. Use your fingers to lay the beef slices out flat on the racks, and try not to overlap them. Dry out the beef for about 2 hours, then swap the sheets top to bottom, front to back, so that they dry evenly. Check them after another hour. They should look leathery. Turn off the oven and let them sit in there for another hour. Taste a piece. It should be chewy with no moisture. Cool the jerky and store, preferably in a resealable plastic bag in a very cool place. 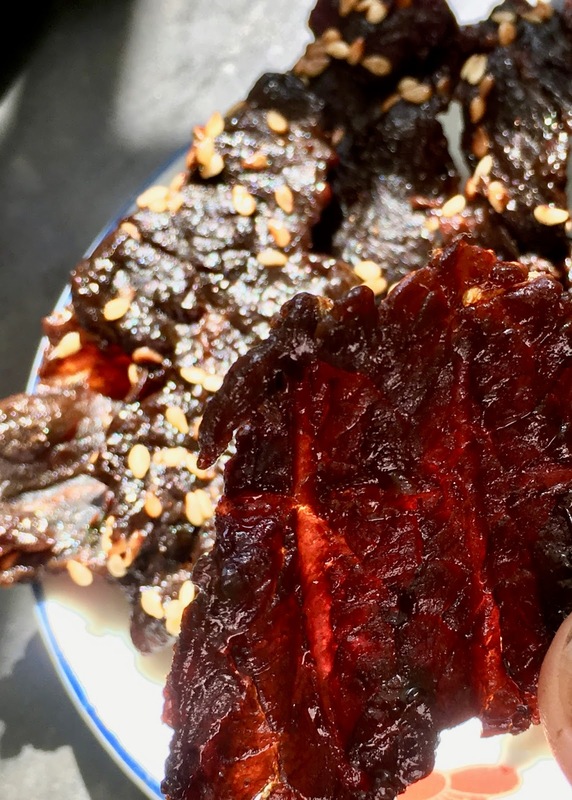 Hi, used to buy Chinese jerky regularly--till it got so expensive. I've tried products from Las Vegas & San Francisco. Have noticed that some are quite sweet & I prefer the more neutral recipe with some heat. How would you characterize this recipe? Could I cut down considerably on the sugar? Thanks! 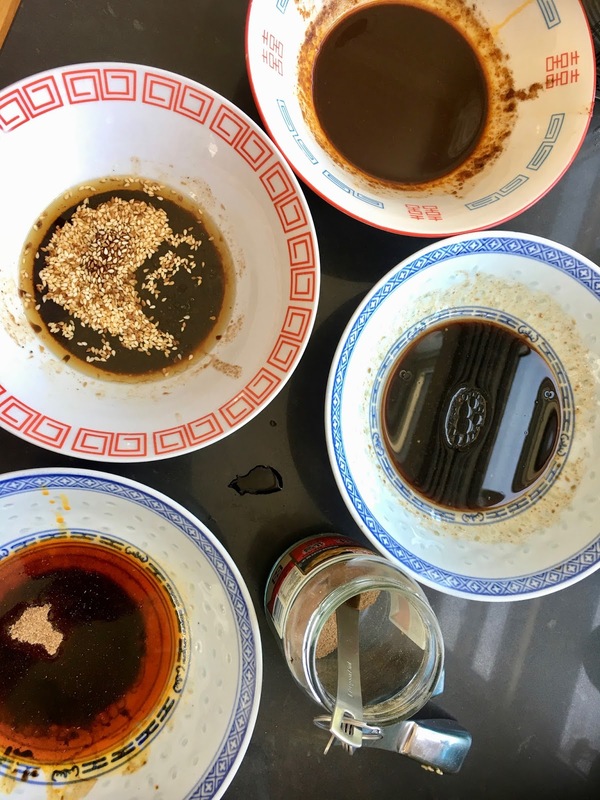 Commercial brands often are fairly sweet and/or salty and/or spicy because this helps to preserve them. However, you can make this as sweet or savory as you like. As you can see, one of these has no sugar at all. What this means is that you get to make jerky just the way you like it!